"For somebody who went on television 50 years ago, and who's been dead for 15 years, I feel like it's the most contemporary subject I've ever worked on, which is very surprising," says producer/director Morgan Neville about American children's television celebrity Fred Rogers, the subject of his new documentary, Won't You Be My Neighbor?. The legend of how Fred Rogers became Mister Rogers began in 1951, when the young man just graduated with a college degree in music composition, and who was considering entering the seminary, caught sight of a pie fight on this new-fangled technology called television. He was struck that it could do something more that simply entertain and sell products. After moving from Pittsburgh to New York to work for a few years at WNBC-TV studying the new medium, he returned to Pittsburgh and began developing children's programming. Although his first program, The Children's Corner, was well received, it was canceled after a few seasons. Rogers moved to Toronto, where he created Mister Rogers' Neighborhood for CBC television in 1963. Eventually, he brought the show back to Pittsburgh at public station WQED, where it ran, with a few short breaks in between, from 1968 to 2001. There were a total of 895 episodes, often tackling difficult subjects like racism, grief, divorce, war and even assassination. During that time, the show and Rogers received many accolades and awards. He would also become an ordained Presbyterian minister, as well as work with the Pittsburgh Children's Center, studying early childhood development alongside such experts as Margaret McFarland and Dr. Benjamin Spock. Rogers would become a cultural icon and a rabid defender of children's rights to be treated with respect and understanding. Rogers died in 2003 from stomach cancer, just short of what would have been his 75th birthday. Neville cut his cinematic teeth primarily making films about his musical heroes, including Brian Wilson: A Beach Boy's Tale (1999), Ray Charles: The Last Blues Man (2004), Respect Yourself: The Stax Records Story (2007), Johnny Cash's America (2008) and his Oscar-winning 20 Feet from Stardom (2013). "I was talking with a high school class recently about projects I've worked on,” Neville says, "and realized everything I'm making films about is stuff I was into by the time I was 15." In 2015, he released three documentaries: Keith Richards: Under the Influence; Best of Enemies (which won the IDA's ABC News/Videosource Award that year); and The Music of Strangers, a film about cellist Yo-Yo Ma's explorations into world music, known as the Silk Road Project. 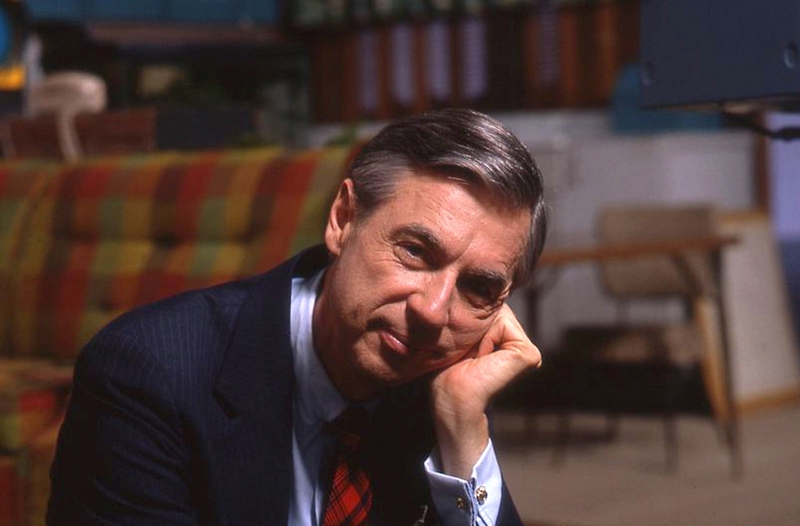 It was through conversations with Ma, who had appeared several times on Mister Rogers' Neighborhood, and whom Ma credits with helping him understand how to use his fame for good, that Neville began diving into YouTube videos of clips from Rogers' television show, his commencement speeches, and especially his testimony in 1969 to the US Senate, which saved public broadcasting from being defunded. Listening to Rogers in these clips, Neville says, was "like a voice I haven't heard in a long time." Like many American children of his generation (he was born in 1967), he grew up watching the program. "A lot of our relationship with him even predates our memory, if you started watching the show when you were two. "It's a question I've been asking myself for a long time: Where are the people that are actually concerned about the long-term good of our communities, our countries, our civilizations? It's like everybody now is so concerned with quarterly returns and election cycles. For somebody who talked to kids, Fred was kind of the consummate adult. He had no agenda. He was empathetic. He cared about the most important issues. And to me, that was just something I felt like, 'Oh, I really want to hear this voice.' It's like a voice that I've been missing. There's a directness to the way Fred Rogers spoke that is so profound. And when we watched Fred, we weren't Republicans or Democrats, or secular or religious, or anything. We were just kind of unformed humans. "I think Fred connected with kids because he could speak on their level. And kids speak without artifice. They tell you what they feel and what they think. They ask questions and they don't worry about being embarrassed about them. And Fred was able to communicate in this very direct way. As we grow up, I feel we let our insecurities and competing agendas obfuscate what we're really thinking and feeling. And Fred had no tolerance for that. He was always about eliminating all the artifice of our personality from what we actually want to hear and say. So that was just a breath of fresh air. It's somebody who's not trying to sell me something or trying to get me to vote for something, somebody who is actually telling me what they think, asking me questions that are important. And that was kind of a starting place for me to think about making the film." Neville began testing the waters with friends and co-workers about doing a film about Rogers, but initially was reluctant because it was "so kind of obvious in a way that it almost seemed like a dumb idea." "I kept asking people: 'Is this a terrible idea to make a Mister Rogers film? Does it somehow seem too corny or too childish?' I guess I felt insecure about it," he admits. "But every single person said, 'Absolutely not.' There was something there. And once I started making the film, I had the sense there was more there, hints of things that were there. In fact, the film became anything but a Pollyanna, childish film." Neville was invited by Sundance Film Festival Senior Programmer Caroline Libresco to pitch the project at the Sundance Institutes's Catalyst Forum, which seeks to connect elite funders and investors with fledgling film projects. "We hadn't started producing the film," Neville explains. "In fact, we didn't think we were going to make the film until next year. We showed up at Catalyst, made our pitch, and the enthusiasm was so strong that everybody kept saying, 'We need this film now!' We basically got the film completely funded out of Catalyst in three days, which as an independent filmmaker does not really happen. So I can't say enough nice things about it." In fact, there were so many investors who wanted in, Neville decided to turn down larger sums from some investors in order to make room for others who wanted to participate. "We really went from not even knowing when we were going to make the film, having not shot anything, and having no money, to a fully-funded production in two months." The film, which premiered earlier this year at the Sundance Film Festival and played SXSW, has had audiences coming up to Neville afterwards, literally in tears. "What's interesting with the film," Neville says, "is that it tends to have us revisit a part of ourselves we probably haven't spent significant time with in decades. It unlocks, in some hard-to-define way, this access to our own inner child, if that doesn't sound too 'new-agey.' But there is something about it that really does work at that level. It felt that way for me working on the film, and I've definitely seen that happen in screenings. I can't think of any other cultural figure who does that. And I wasn't necessarily thinking about that when making the film, but it's been one of the many happy surprises of screening the film for people. "I also feel like there's no way to see my documentary and not think about our present political situation," he continues, "though we had no kind of agenda about the film in terms of trying to talk about politics in 2018, because I started the film before the last election. I think of it this way: We have a culture that rewards the worst in us. It's a lot easier to make money or to rule people through fear and anger and hatred. And it's really hard to do that through kindness and love. Love is fundamentally what Fred was always talking about, yet it seems 'quaint' to some people today. There’s something about Fred that’s so pure and incorruptible that it almost seems radical. Neville feels one of the themes he's been working out through his films is how we seek to find common ground among people of different backgrounds, beliefs and cultures. And this film is no different, though maybe more so. "I think over the past couple of years we've had a lot of real interesting debates in the doc world about who our audience should be and if we're just preaching to the converted,” Neville says. "I very consciously wanted to make a film that could reach an audience who may not normally ever watch a documentary and maybe doesn't agree with me on a lot of things politically, but might find some common ground around these issues." He has screened the film for some religious organizations, as "they take ownership over Fred too; they feel he's one of their own. I feel that this is a really positive step because it means there is common ground." It should be noted that Rogers never introduced any theological or political bent into the show, though he was an ordained minister and a lifelong Republican. One of the auspicious gifts in mining the story for Neville was getting access to Rogers' vast archive at the Fred Rogers Center, in Latrobe, Pennsylvania. "For an archive documentary, this was about as perfect as it gets," Neville says. "There were the episodes, all the outtakes of all the episodes, the field pieces that were all shot on film, there were all the letters he got—somewhere on the order of a million pieces of mail, and he responded to every single one—and they're all organized by year and theme. There were photos, every script, memos....an overwhelming amount of material. Fred saved everything. I didn't watch every episode, but somebody on our team watched every episode, especially [assistant editor] Kate Brokaw, who watched everything for months. "It's that massive amount of work that comes back to just a few shots here or there. We were trying to do a film that's kind of simple and deep. Fred's style of communication was simple and deep. And it's really difficult to make a film be simple, and to make it feel polished in that way. It's amazing how often people think, If it's simple, it must be easy. It's not like there are thousands of edits in the film, just like Fred didn't like a lot of edits. I always try to let my subject matter reflect how I tell the story. Yes, there are storytelling devices I like, but I also like changing my style. It just keeps it more interesting to me." In Won't You Be My Neighbor?, Tom Junod, who became a friend of Rogers while writing a profile of him for Esquire magazine, suggests the question to ask at the end of the day is how well Rogers succeeded in achieving his goal. Neville sees it as a mixed bag. "I think it depends how you measure success," Neville says. "Fred had a tremendous impact, without a doubt. He was one of the most important figures in the lives of millions of children. He had an important voice in children's media for decades. But it's hard to see that a lot of other people followed in his footsteps. That's not to discount all the good he did, but throughout Fred's life—and we talk about this in the film—it felt like he was fighting the same battles and the world was still getting worse. Kids programming when he started was about selling sugar and toys, and kids programming today is still the same thing. I think Fred did change a number of fundamental things about public broadcasting, but he was also a major factor in how we think about childhood. "When you look at how people thought about children and children's emotions in the early '60s, it's radically different. I know for those of us who had parents of a certain generation, they didn't care about kids' emotional states, what they were aware of, or what they were taking in. I think that now—I have kids of my own—it's taken for granted that we're very understanding that our kids take in a lot more and have an emotional maturity at different levels, at different ages. A lot of what Fred was in tune with, which seemed very cutting-edge back then, is now very mainstream in terms of thinking about these things. "But the question I get all the time is, 'Who is the next Fred Rogers?' or, 'Who is the Fred Rogers of today?' And I think it's the wrong question. It's not helpful for us to try and guess what Fred may have done or what somebody else may do to try and make the world right for us. I think the real question is, 'What are we going to do?' I feel like Fred's real impact is that imprint he made in the millions and millions of kids who watched him. That's the thing I'm trying to tap into. And again, being cultural, it's hard to measure. But I believe it's there. "Having worked on this film and talked to many people, I've heard scores of anecdotes of people talking about how important Fred was to them in their childhood, or it's the first time they saw someone who looked like them on TV, or somebody with a handicap saying they'd never seen a child with a handicap on TV before, or they had written to Fred and he had written back. Scores of these stories. Without a doubt, he had a massive influence, but on a one-on-one level. His influence is in each and every individual who grew up watching him." "I'm by nature an optimistic person, even when it's very difficult to be an optimist," Neville concludes. "I really wanted to make a film for all people because Fred was the kind of figure that united people. And, it was an opportunity to make a film that asked a lot of fundamental questions about how we should be treating each other. It always feels arrogant to say your film is going to help, but nevertheless, I think all of us documentary filmmakers make these films in the face of not knowing if it'll make any difference, but hoping and believing they will." Won't You Be My Neighbor?, a project of IDA's Fiscal Sponsorship program, is a production of Tremolo Productions in association with Impact Partners and Independent Lens/PBS. The film opens in select theaters on June 8 through Focus Features.